As match officials, there is very little chance to overcome a mistake, even if the rest of the game is flawless, the referee is remembered for that decision. And in some circumstances, getting the decision correct also gets you bad press, as Alain Rolland saw with his red carding of Sam Warburton. This means that not only do match officials need to make the right decision, they need to be seen to be following a process that persuades the majority of people watching that the decision is correct. In short, the job is harder than it has ever been. As match officials, the greatest praise they can generally get is that no one is talking about them after the game, and that all attention is on the players, and the game they played. The desire & need for the team of 4 (including the Television Match Official) to get every decision & non decision right is crucial, and this is where 'Clear & Obvious' comes in to play. 'Clear & Obvious' in its most simple form means that a referee will only penalise a team for an offence that is beyond doubt. This includes a clear knock-on, to a clear offside, or clearly lying over a ball. If the referee is any doubt, then the decision should be to play on. 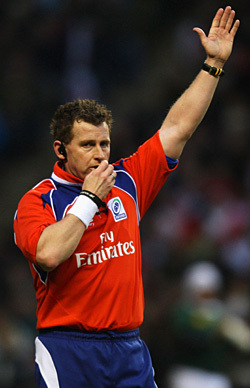 In the case of a try being scored, there is an opportunity for the referee to check with the TMO should they, or their team, believe there may have been an offence in the build to the try. However, this is only if the team of 4 suspect something, if they have not seen any issues there will be no review. In a tight game, 'Clear & Obvious' is more important than the above, it becomes a vital prime directive. A penalty in a tight game can mean points, or the removal of a phase of pressure, so the offence to warrant giving a penalty must be 100% clear in the Referee, or Assistant Referee's mind before calling it. This in itself gives a higher probability of the call being correct, especially in the view of multiple camera angles & slow motion replays to the commentators & watching audience. Players & Coaches at the elite level of the game are very supportive of this approach. It allows the players to compete fairly, and to determine the outcome of a game on their own abilities. After all, we all (Including referees) watch rugby for the enjoyment of teams trying to skillfully score more points than the other. Only problem with this article is that you're merely preaching to the converted as barely a diddly squat of spectators will read it....shame about that, they might have learnt something. Ah, not true. It's running as an advert and already has 524 views via other mediums, & Brian Moore has tweeted about the irony of having to explain 'Clear & obvious". Personally I am not a fan of the clear and obvious mantra. What about an offence that is perfectly clear but not at all obvious ? You are going to blow, right.. It's not mean to be broken down into individual bits. It's a term to mean unless I am 100% sure I am not blowing this whistle. It's something of a tautology. But a useful tool none the less. Even if an event is obvious it is not always clear. Therein lies the difficulty. If it is clear that it is a Penalty offence then it is obvious that it is a Penalty offence. You see a punch land: It is both clear and obvious that a punch has landed therefore a Penalty offence has occured. A player come out of a maul with a bloody nose it is both clear and obvious that something happened. It its neither clear nor obvious what that "something" was. It was obvious to you. On the scenario you propose nothing would be C & O as someone somewhere in the ground will not see it. C & O must be seen from the referee's perspective. Ie if it's a "grey area" between a clear black and white decision - it doesn't get blown.